The concept of a fish curry seems to freak people out. So much so, the mere suggestion of it usually elicits looks of suspicion and a chorus of “ugh!” and “ewww!“. Such reactions have always confounded me because fish curry is, in a word, delicious. Over the years I have tried to introduce my sceptical dinner guests to the delights of fish curry and I have found the most success with molee. A speciality of Kerala in Southern India molee is, strictly speaking a fish stew, but with its rich and fragrant coconut sauce it can still be considered a curry. Simple to make and requiring very few ingredients, molee is surprisingly complex in flavour and makes a great addition to any Indian meal. Aside from the fish, the key ingredient to molee are curry leaves. The dish benefits immensely from fresh curry leaves, but if you can’t find these then dried leaves will do at a pinch. Whenever I manage to find fresh curry leaves I always make sure I freeze some, as these will still be superior to dried. 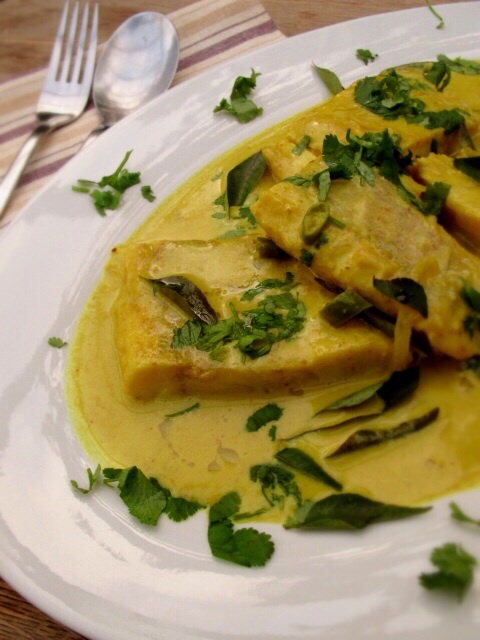 Still not convinced about fish curry? Give molee a go and trust me, before you know it you’ll be tucking into some Fish Head Curry!